For the second year in a row, North Carolina holds the No. 1 spot on Forbes magazine’s Best States for Business ranking. 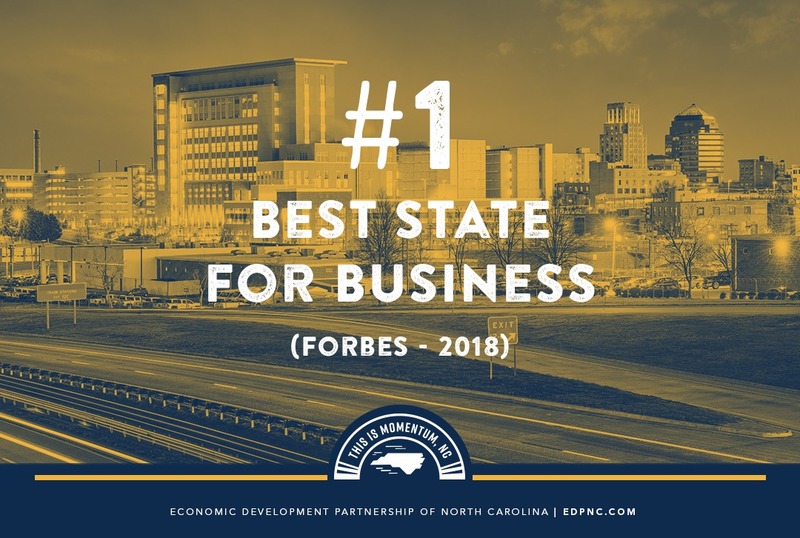 North Carolina has been the only state to consistently place among the top five states for 13 straight years since Forbes began issuing the annual Best States for Business list. In an article announcing the 2018 list, Forbes says North Carolina’s labor, energy and tax costs are all well below the national average and rank as the second lowest in the U.S. overall. And North Carolina’s 3 percent corporate tax rate, scheduled to drop to 2.5 percent in 2019, is the lowest in the nation. The state also has a highly educated labor supply, graduating from 53 colleges and universities including Tier 1 research universities Duke, the University of North Carolina at Chapel Hill and North Carolina State. The state’s economic outlook is strong, Forbes says, noting that growth in both jobs and gross state product is expected to be among the strongest in the country over the next five years. In addition, North Carolina’s population is growing at twice the U.S. average. Read Forbes‘ full coverage of its Best States for Business 2018 here.